The Nike Air Force 1 UltraForce Mid almost always gets five-star ratings from several purchasers. Those who love to play with colors will surely have fun choosing from this model’s at least five available colorways. At only $110 a pair, the Nike Air Force 1 UltraForce Mid is reasonably priced. The weight-reducing Ultra treatment done on this model must have worked so well because several reviewers shared that they really feel and love the shoe’s lightness. Many reviewers took note of how well-crafted a pair of Nike Air Force 1 UltraForce Mid shoes is. A good number of wearers shared that this model fits as expected. Some reviewers shared that the Nike Air Force 1 UltraForce Mid goes with almost any outfit in their wardrobe. Several reviewers reported that this model is durable. Many of those who left reviews expressed their willingness to recommend this shoe to their friends and colleagues. One reviewer pointed out that the Nike Air Force 1 UltraForce Mid has a unique design, and maneuvering it takes a lot of getting used to. A reviewer observed that this shoe creases very easily; and this, for him, is a major turn off. Sold at $110 per pair, the Nike Air Force 1 Mid satisfactorily delivers on the promises of its price. Many reviewers feel that the Ultra treatment done on this model worked because they really experience the lightness and comfort that the treatment aims to achieve in the first place. Some also love the flexibility of this model, saying that it goes well with almost anything that they pair it up with. Indeed, one need not look any further to get a good shoe deal. The Nike Air Force 1 was released in 1982, and one need not be a genius to know where the shoe got its name. It of course takes after the presidential aircraft Air Force One; and by doing so, it indirectly promises a high-profile treatment to its wearers. Pleasing the market proved to be hard work, but surely not impossible nor difficult. The Air Force 1, being the first basketball shoe to use the Nike Air technology, which allowed wearers, among many other things, to literally walk on air. Well, packets filled with air to be exact. Since its release, the Air Force 1 has been subjected to numerous transformations. One of its most recent forms is the Nike Air Force 1 UltraForce Mid, which was released just in January 2017. Though it retains the use of the Nike Air, this iteration went through the Ultra treatment, which makes classic shoes lighter, more comfortable, and readier to take on the challenges of the modern world. 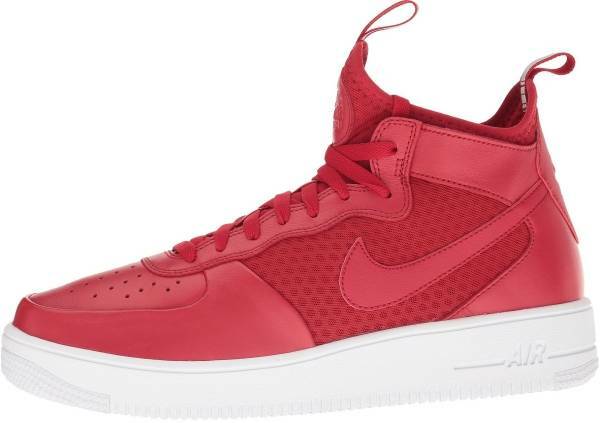 The Nike Air Force 1 UltraForce Mid sports a mid-top cut, and it perceptually elongates the wearer’s foot when worn. It has a monochromatic appearance, and it helps in further enhancing the universality of its appeal. Together with the elongated appearance, this tonal colorway helps make the Nike Air Force 1 UltraForce Mid palatable even when paired with semi-formal pieces such as colored dress pants. This model also does not frustrate those who love the classic look of the original. Although the Nike Air Force 1 UltraForce Mid is largely made of mesh, it has leather overlays in the toe and heel areas to give it its classical form. The Nike Air Force 1 UltraForce Mid is a stylish pair of kicks for men and women. It comes in sizes 5 to 12 for women, and sizes 6 to 15 for men. There is no need to worry about snugness because its effective lacing system provides ample allowance for adjustment. From the name itself, the Nike Air Force 1 UltraForce Mid is easily recognized because of its mid-top cut. As far as aesthetics is concerned, this type of cut perceptually elongates the foot. This perceptual effect is one that many appreciate. The midsole that uses the lightweight Nike Air technology is noteworthy. It doubles as the shoe’s outsole, significantly reducing the weight of this model. In fact, there are claims that the Nike Air Force 1 UltraForce Mid is the lightest Air Force 1 iteration to date. This model has pull tabs on the heel and tongue so that it’s easy to slip in and out of this shoe. The Nike Air Force 1 UltraForce Mid has a one-piece internal bootie that helps in keeping the foot cool. The leather overlay in the toe area is perforated to further enhance breathability.